We’ve finally made it to the last stage of the Mock Recruitment Process, the final interview! Just one last stage between you and that vacationer/grad role! 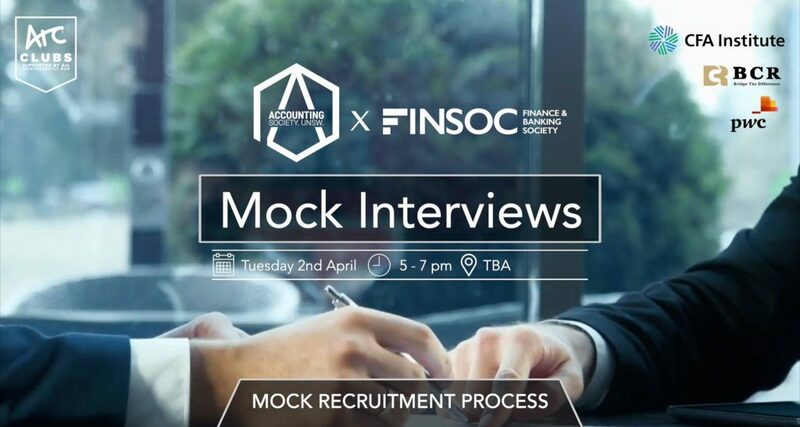 To get you prepped and ready to ace that interview, AccSoc has partnered with FinSoc to bring you a mock interview practice session with real HR and industry representatives! These reps have been sourced from big 4 firms, such as PWC, as well as others to be announced. The session will consist of each attendee receiving a consultation-like mock interview with an experienced AccSoc or FinSoc representative who has been in a similar final interview before. After preparation, you’ll then be directed to complete a final interview with an industry representative, where you’ll answer questions in real-interview conditions! All attendees will receive personalised feedback on their response and performance, so you’ll know just how ready you are and what to work on before your next final interview! With the conclusion of AccSoc’s Mock Recruitment Process, we wish everyone the best of luck in their job applications!